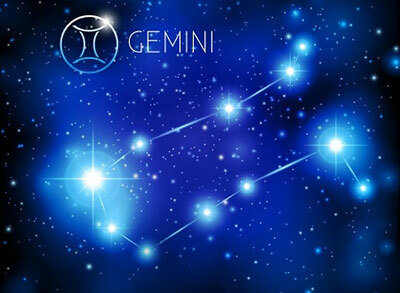 Gemini – Two For The Price Of One! The glyph for those born under a Gemini Sun, between May 21 and June 21, is the Roman numeral for the number 2. The Twins. Like their symbol, Gemini tends to have more than one side to their personality. They may have a public persona, and an entirely different private side seen only by their closest friends and confidantes. Many Geminis are excellent communicators and love to talk. This comes as no surprise, since their planetary ruler is Mercury, the messenger. Talk to a Gemini, and you’ll be talking to someone who is witty, intelligent, and a quick thinker. Sometimes they may forget to put on a filter, so be prepared for anything that comes out. They’re likely to be found in the middle of any lively conversation or party, and chances are, if you’ve ever met a persuasive salesman, he had Gemini somewhere in his natal chart. Yes, this is the zodiac sign of communication! It’s also the sign most likely to be on top of the latest technology and gadgets, along with their fellow Air sign, Aquarius. The flip side to all of this is that Gemini tends to lean toward superficiality. They would skim through reading material, for instance, or only notice the surface traits of others. They can be like hummingbirds, forever in motion and looking for that next drop of nectar, but forgetting to linger. Gemini may also have a slightly nervous temperament and can be prone to depression or self-doubt. There’s that dual personality again! Gemini makes an excellent friend, with her witty personality and endless supply of banter, but can struggle when it comes to deeper relationships. The Twins always want novelty and adventure in their lives, and long-term commitments don’t always offer this kind of fun. Ruled by the head, Gemini may approach romance from strictly a logical perspective. That might not go over well with their partners, especially the more emotionally driven signs. Still, they can be excellent matches for those who are able and willing to keep up with their breakneck speed. Gemini can never resist flirting, either, and this can present an ongoing challenge for any committed relationship. The intellect and wit of the Gemini needs the right kind of arena to shine. A job with a lot of routine or boredom is going to tax a Gemini, so it’s crucial that he or she find the right position. Many Geminis have done well in creative fields like the performing arts, or else arenas where quick thinking is required, such as law. The chameleon-like movie star, Johnny Depp, and smooth-talking politician, John F. Kennedy, are both Gemini personified. The word that rules Gemini above all is duality. If you are a Gemini or know one, chances are you probably have seen more than one side to their personality. This doesn’t refer to the classic “split personality” conundrum, but it may be that different approaches are needed to handle different aspects of the Gemini self. All of us, regardless of our zodiac sign, can feel like a different person at times – depending on our mood, the seasons, or what is going on in our lives. For Gemini, it simply means that every day is different. Remember that as you go through life with these lively, entertaining Twins!